Dogs have built-in fur coats, but they still get cold during their winter walks. Even if Fido isn’t hiding whenever you pull out the leash, you should still determine your dog’s tolerance for snowy romps, judging from this infographic spotted by Lifehacker, which is based on factors like size and breed (and not just enthusiasm for eating snow). Created by Dr. Kim Smyth, a staff veterinarian with pet insurance company Petplan, the chart is modeled after a scale developed by Tufts University [PDF] that determines how canines respond to weather conditions depending on their builds. Before scoping out the recent bomb cyclone's aftermath with your four-legged friend, check the temperature first (including wind chill), and then reference the chart to gauge whether your dog can safely withstand the elements. 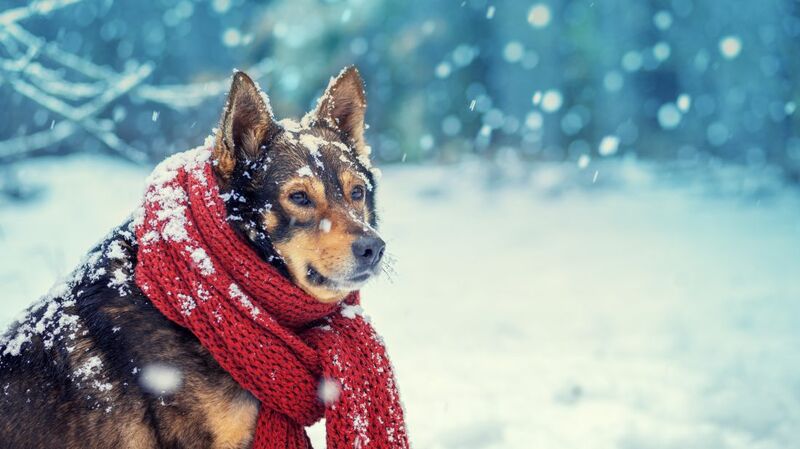 Small- to medium-sized dogs face cold-weather risks like hypothermia and frostbite when temperatures dip to 40°F. Larger dogs can tough it out for a little longer, but all pet owners should exercise caution and keep walks brief once the thermometer reaches 30°F. Canine accessories like sweaters or booties can safely prolong emergency bathroom strolls. Tiny pet shoes also protect vulnerable paws from sidewalk chemicals like antifreeze, according to NPR. That said, no two canines—nor their fluff—are exactly alike. Dogs that are conditioned for the cold, or ones with heavy coats, fare better than older dogs or those with health conditions. Tiny, short-haired dogs may struggle too. Shivering is the first sign of hypothermia, Smyth told WBUR in an interview, so if you see your pups trembling, "you want to get these dogs inside, wrap them up in a warm towel or blanket, and get them to the vet if you need to," she says.